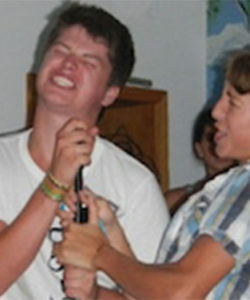 Each week campers get to let loose and have fun on dance night! Week 6 - 50's Rock n' Roll... Grease is the Word! 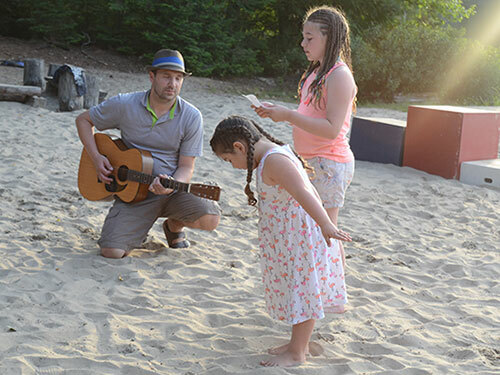 Variety night is party night at the beach! 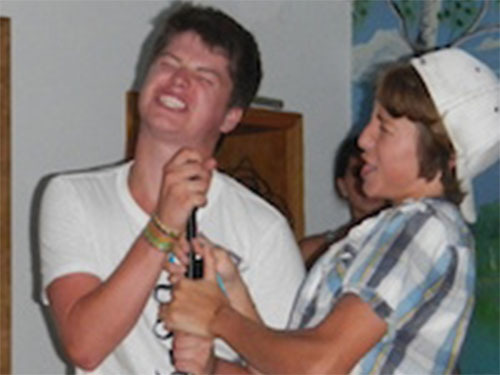 Every Friday evening campers perform skits and dances that they have practiced all week, which is followed by an awards ceremony for the week. 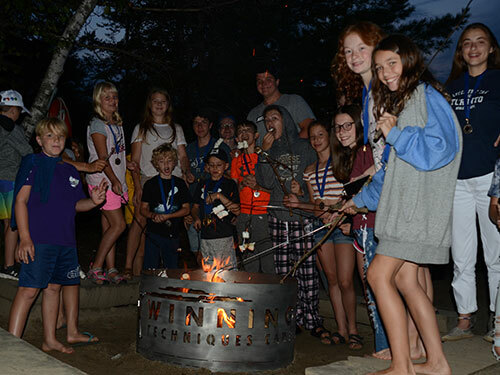 Join us at camp and see if maybe you win a gold for the archery tournament - or maybe take home the Camper of the Week trophy! At this popular station, Winning Techniques campers learn how to use a bow and arrow. All campers learn the art of archery from experienced camp counselors, and practice it daily. 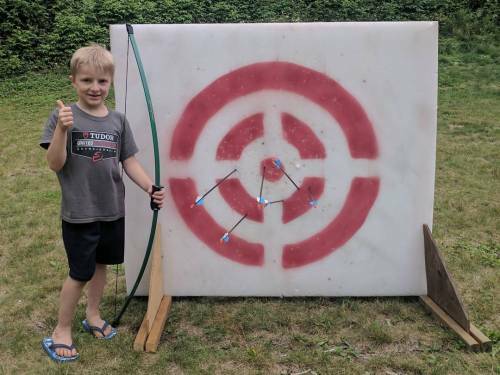 Beginners and experienced archers can aim and shoot at targets set up at different distances, and each week a prize is awarded to the camper with the most accurate shooting skills. 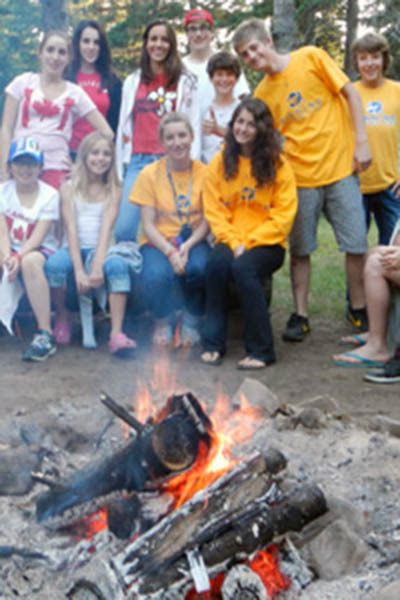 Campers gather around our large bonfire for orientation night where they learn eachother's names and get to know everyone from all the specialized programs. 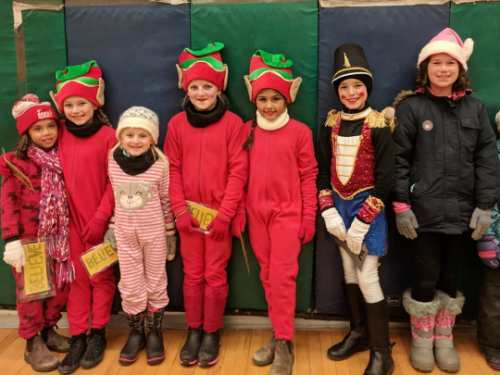 A few times a week we like to gather as a group and roast marshmallows while getting to know new friends - this is also a great time to share songs and join in on a sing-a-long! Of course, the bonfire is not all fun and games, as we teach the campers how the build a fire with basic fire building skills and about fire safety. Arts and crafts has always been a special part of our camp. 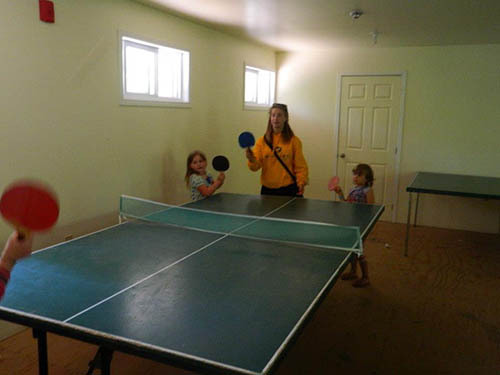 In the beginning, one of our directors, Kim, began by teaching painting and drawing to campers. 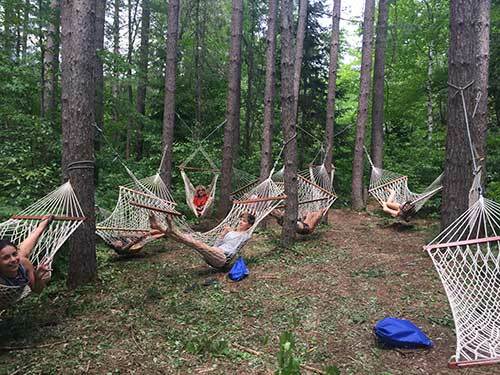 However, as our camp grew so did our craft and creative capabilities. 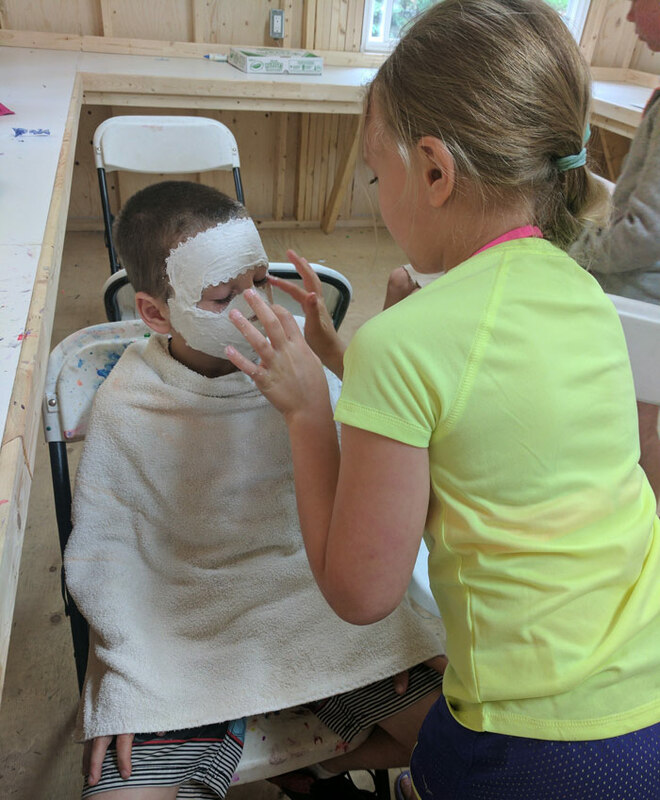 In 2017 we built a brand new space for kids to get messy with paint, learn how to make bracelets and necklaces, plaster masks, and so much more! The campers get to bring home all of their artistic creations! 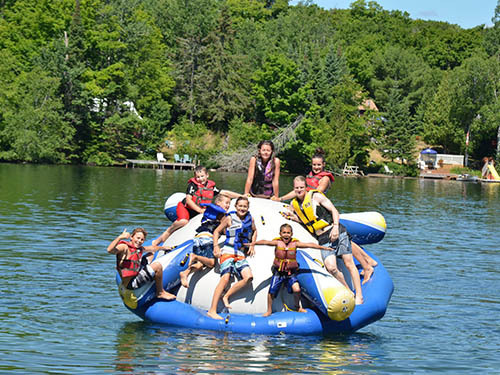 All of our campers get to have a thrilling Friday when we take out the tubes and go for rides around the lake. Tubing is always good for a laugh, and a fun activity for everyone to participate in just before our weekly variety nights! Whether going for a leisurely stroll around the lake on a sit down tube, or a fast-passed bumpy ride, tubing is for everyone! 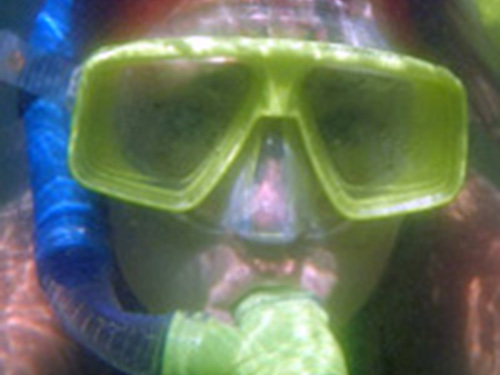 Watersports are available for all specialty programs. Waterskiing is exactly that, skiing on water! 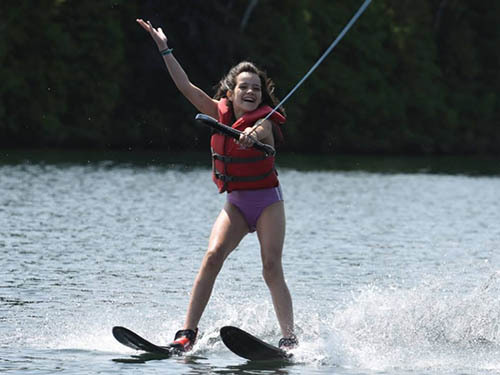 Campers can choose to try this sport, along with others like wakeboarding, or even wakesurfing. Here at Winning Techniques Camp campers of all levels and abilities have the opportunity to recieve watersports lessons from trained watersports instructors. Our Boom is a tool for beginners just learning the skills, as it allows the student to get up on the water and still be able to hear corrections from the driver or instructor. This confidence builder allows for excellent communication, which really speeds up the campers development - More advanced skiers will learn to slalom ski and barefoot on the boom aswell. 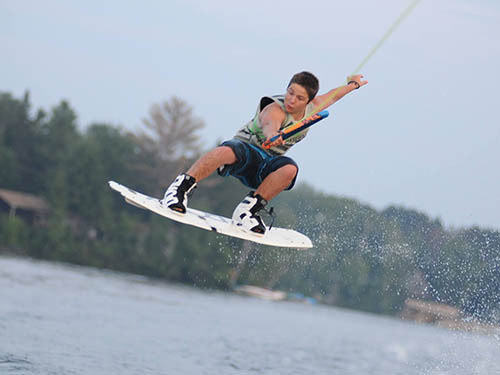 Whether you are in the Intense Watersports program or not, wakeboarding is an option for everyone! 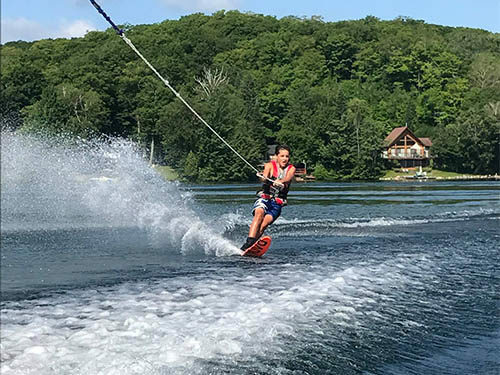 Similar to snowboarding, the wakeboard has bindings for both feet, and is used to carve the water and jump of the wake like a ramp! If you're just looking to cruise around the lake, or try some awesome jumps - wakeboarding is so much fun for everyone. 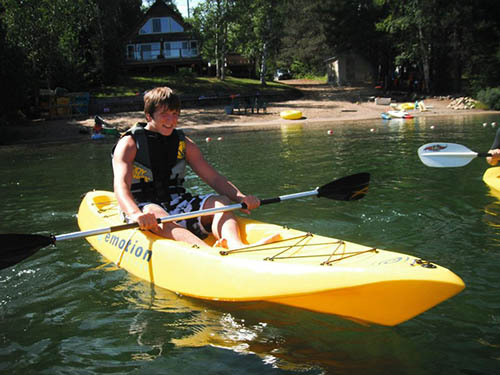 Kayaking is a mix of instruction and relaxation where campers will take a trip with their camp counsellor to learn about fundamental strokes and techniques, while also enjoying the sights of the lake. Winning Techniques counsellors are trained and certified in conjunction with the Ontario Recreational Canoe Association (ORCA). 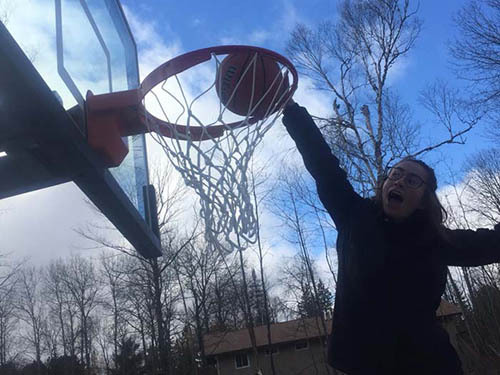 New for 2017 is our regulation sized basketball court for campers to learn & practice their shot or challenge their cabin mates to games! At Winning Techniques there are so many things to see, and hiking is a great way to enjoy the beautiful land that our camp is located on. 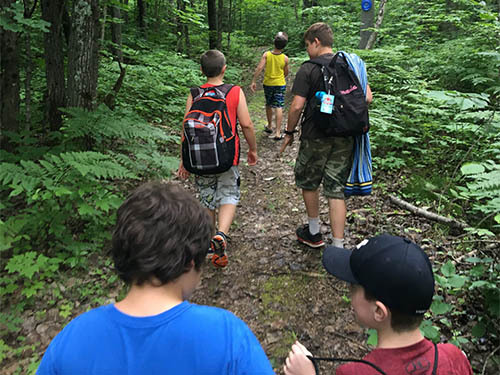 Campers can enjoy a nature hike guided by their counsellor, and if they're quiet they may see dear, rabbits and other small animals. Each week we pair off into teams and get the chance to venture into the bush for a wilderness scavenger hunt! Experience Water Sports campers get to experence surfing while being miles away from the ocean! 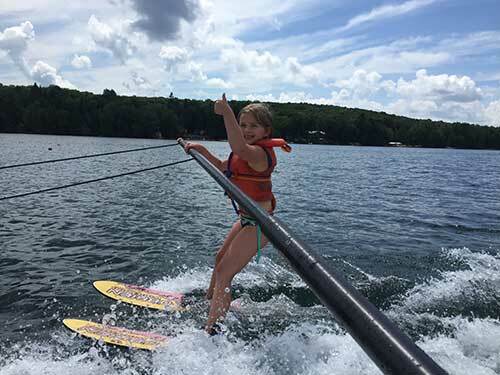 After mastering the basics of waterskiing and wakeboarding, campers get to try out riding a wave behind the boat. 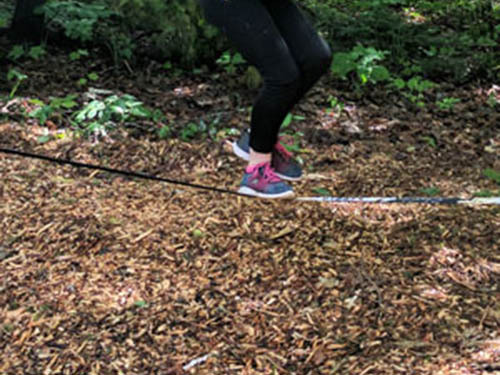 The low ropes course is a fun, team-building station that is great for learning to work with fellow campers and teammates. This is another one of our most popular stations, located around the rockwall for campers to work together everyday building core strength and friendships. 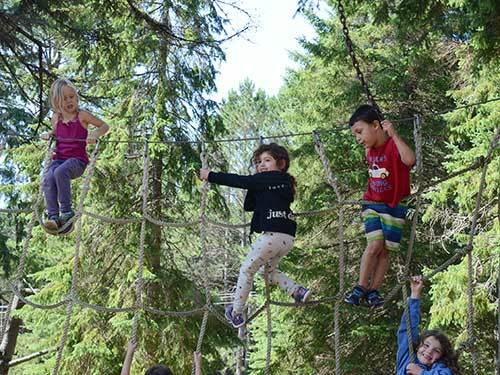 Experienced counsellors work as instructors to help spot and support the campers through the challenging and fun ropes course. 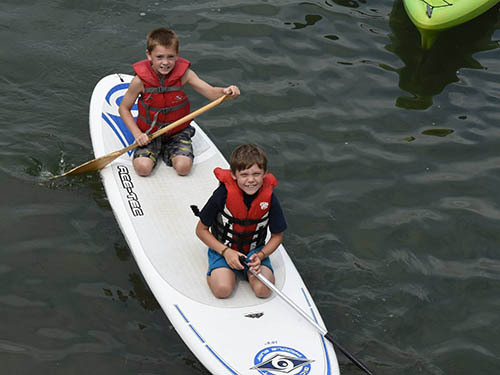 Paddle boarding, like canoeing or kayaking, is a fun way to see the sights of Clear Lake while providing an opportunity to work on on balance and core strength. It's definitely a little more of a challenge as you have to try not to fall off! 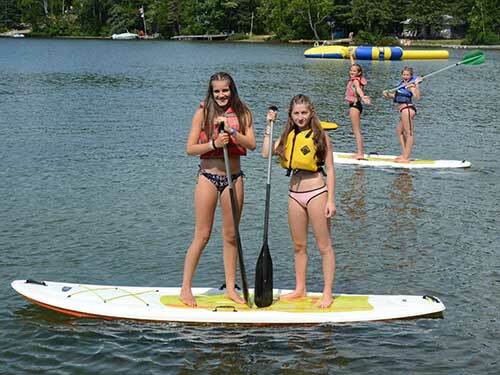 This station is a camp favourite - and new for 2018 we have 6 new paddle boards to make a group station! 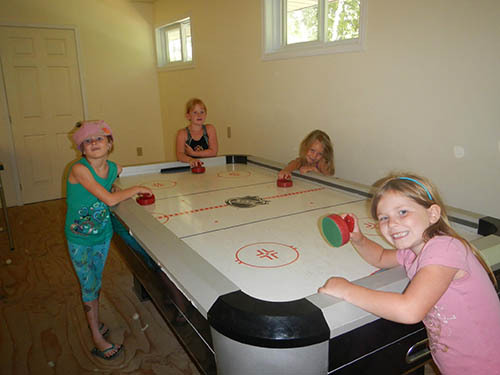 Here at camp we built our own mini-putt course in the backyard - it is so much fun! 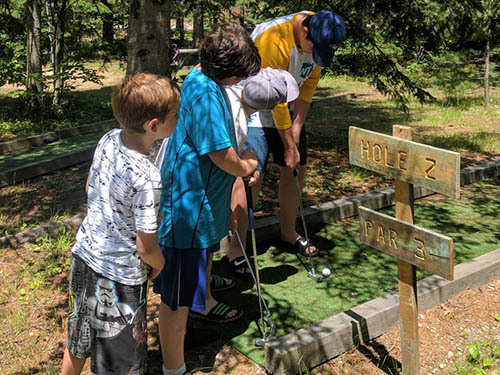 This station is a relaxing activity where groups are often found socializing while they practice their shot, or challenging each other to see who can get the lowest score. The last step in the watersports progression is BAREFOOTING! 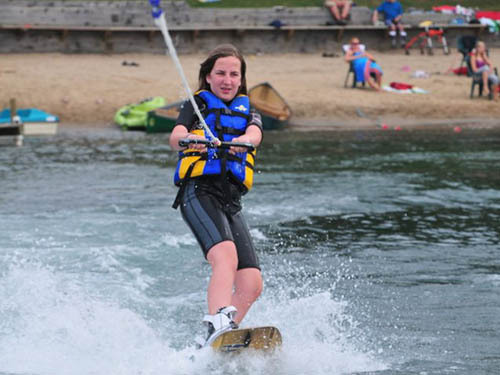 Advanced waterskiers and wakeboarders get to learn and experience what it is like to ski on the water... without skis! 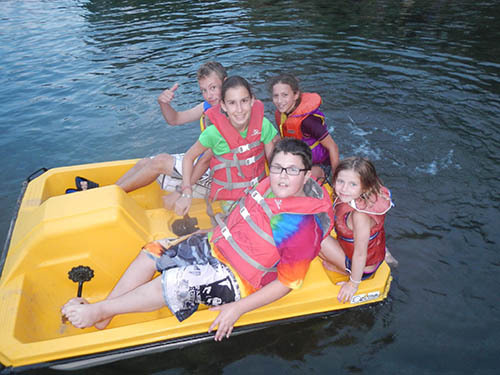 Campers are free to take out one of our paddle boats during their beach time. It is a great way for them to learn basic boating safety while having a bit of fun. 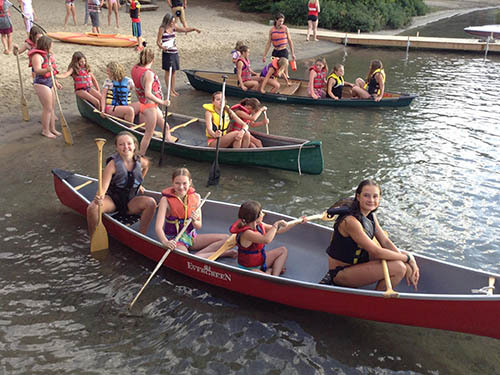 All campers learn proper canoeing techniques from our qualified camp counsellors. Journeys around the lake are encouraged, and come along with loon sightings and Northern Ontario scenery - sometimes even a beaver can be seen in the distance! Rainy days don't stop the fun at Winning Techniques Camp, our campers get to have some free time and are encouraged to play games with a group of new friends. They may learn a new card game or just laugh along with a group of campers playing a variety of fun board games. 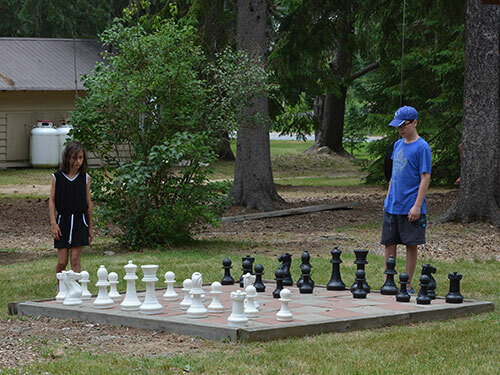 Some campers may prefer to challenge their friends in a game of checkers or chess! 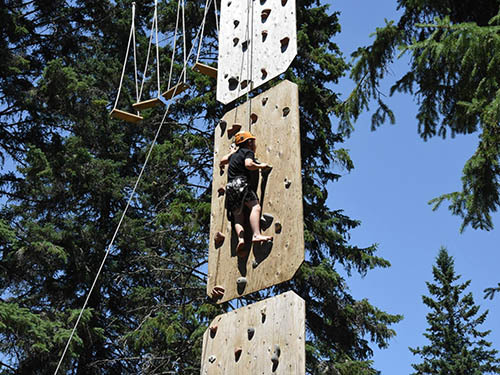 Our rockclimbing wall is a unique four-panel course hung between two large trees, with a highropes element at the top! It is one of our camper's favourite stations to hang out at. Not only is it a satisfying feat to reach the top and ring the bell, but awards are awarded each week to those who can do it in record time! This station is multi-purpose as it disguises a cross-training like workout into a fun climbing challenge. 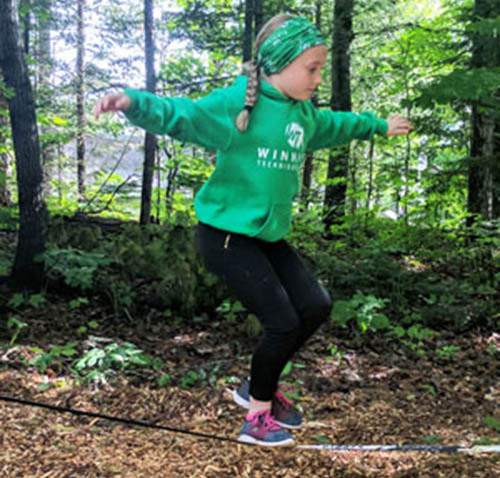 The Slacklines are our new addition to the Trampoline Zone - slacklines are essentially stretchy, flat webbing to walk across, bounce on, and try so many things! 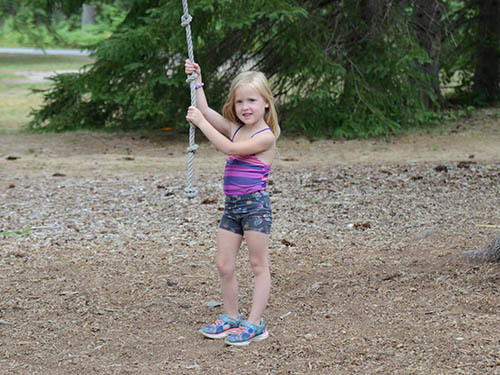 Campers get to practice and test their balance and agility, and maybe even try some tricks. The beach is a great place to swim and splash, but viewing the underwater world of our Northern Canadian lake is always a treat. 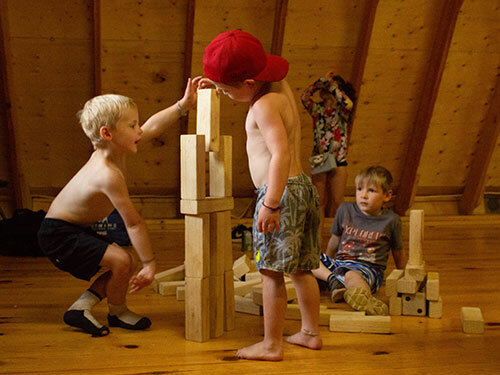 Campers are encouraged to grab a snorkel, mask and fins from the beach hut and start adventuring with their friends! Wake Skating is just like Wake Boarding but without boots to hold in your feet! Similar to Skateboarding, Wake Skating is super fun for those up for a challenge. 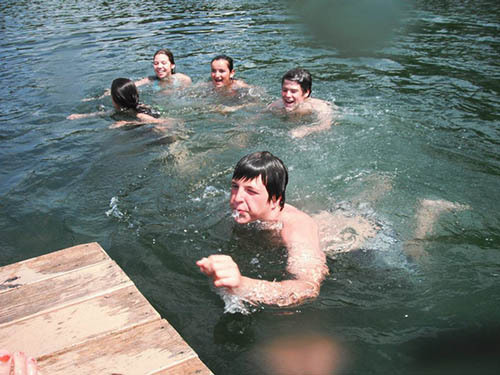 The water is a great place to spend warm summer days, and while jumping off the floating raft is always fun, Winning Techniques offers fun water toys at the beach also! The Rock-It is a favourite - It is a floating ball of absolute fun! 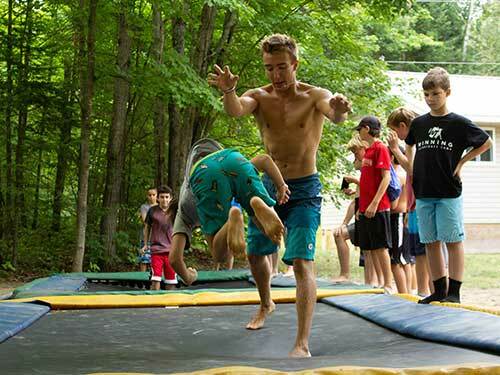 You can always find campers either jumping off or playing creative games like SHARK with their camp counselor! All of the groups from each of our programs have the option to head down to enjoy the beach everyday. 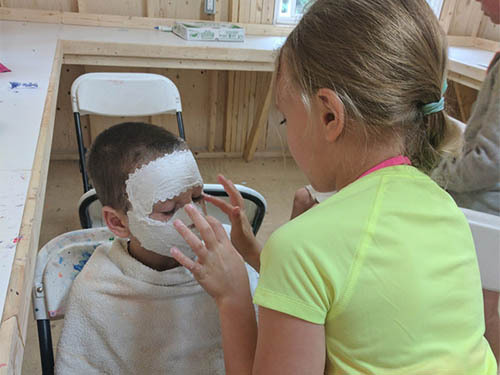 Campers build sand castles, have fun on the swim raft, swim in the swim area, play games, snorkel, paddle boat & hang out with their new friends while sun bathing. Of course, the Lifeguards are always on duty while the campers are in the water. Our beautiful sand beach has a gradual slope that leads into a warm spring fed lake. A little bit of beach time offers the perfect opportunity for some rest and relaxation. 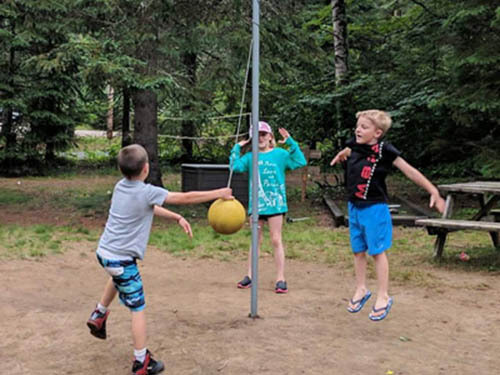 Here at Winning Techniques Camp we are equipped with two full-sized trampolines for campers to learn all kinds of tricks or just see how high they can jump! 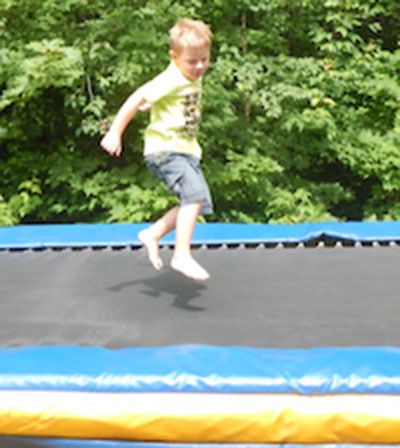 Our certified trampoline instructor, Carl, is available to help the more advanced learners progress their tricks into flips and other awesome moves. Whether you just want to jump and have fun, or are serious about trampoline, this station is meant for everyone. 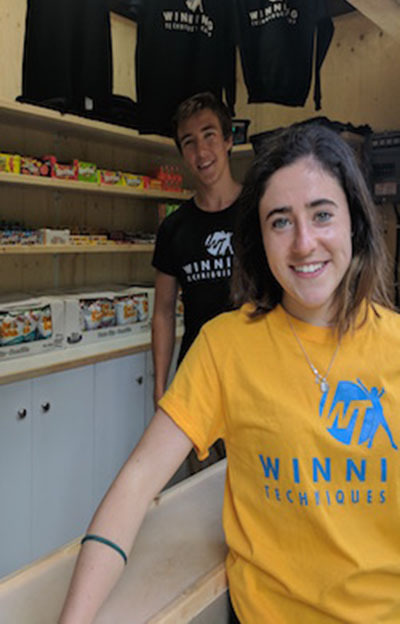 Our Tuck Shop is open for business daily after lunch and dinner. 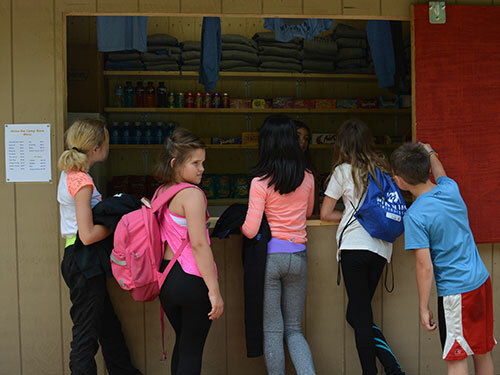 Children are encouraged to eat healthy food before indulging in snacks purchased from the Tuck Shop. 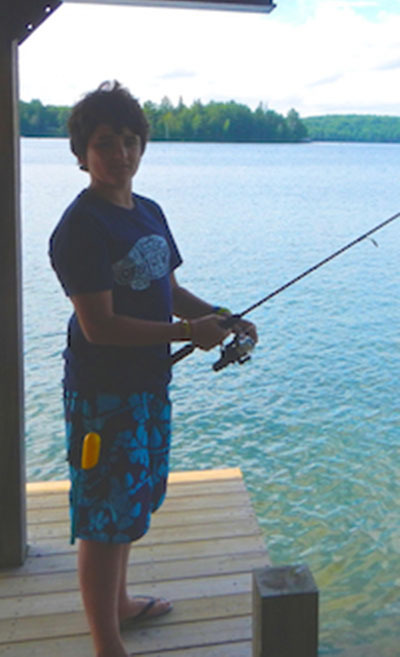 We have a good supply of fishing rods and tackle for our campers! 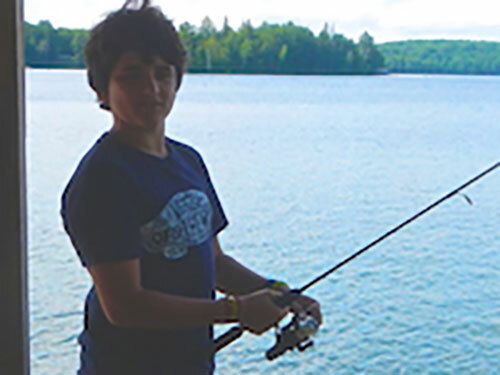 Great fishing for children can be experienced from out dock or boats. 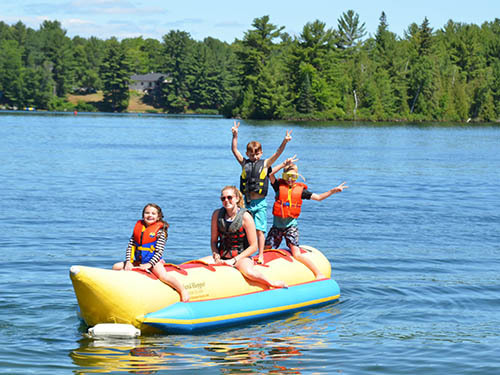 Similar to tubing, the Banana hold 6 campers and is towed behind one of the motor boats. The banana is a super fun activity to try with your group! Complete with soccer nets and plenty of room to run our multi purpose field is perfect for football, soccer, and so many other games for groups to play! 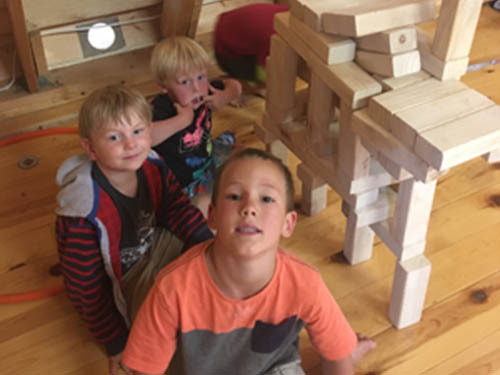 The Activity Centre is full of so many indoor games from pool and billards to giant JENGA - It is the best place for a rainy day escape, or just some indoor fun! Everybody loves volleyball on our regulation standard sand volleyball court. This popular station is available for any group to use recreationally - looking to get more serious? Why don't you sign up for the weekly Table Tennis tournament? This is an awesome game for hand-eye coordination and a favourite for the competitive at heart. 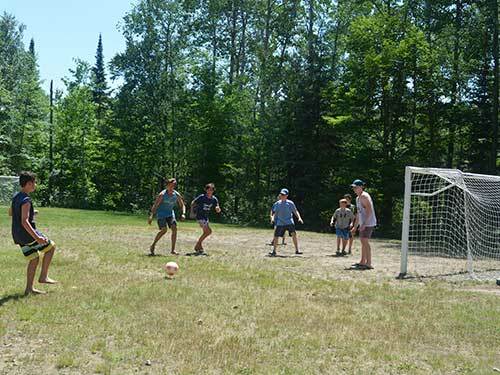 You can always find a group of campers here challenging their friends to see who will win! 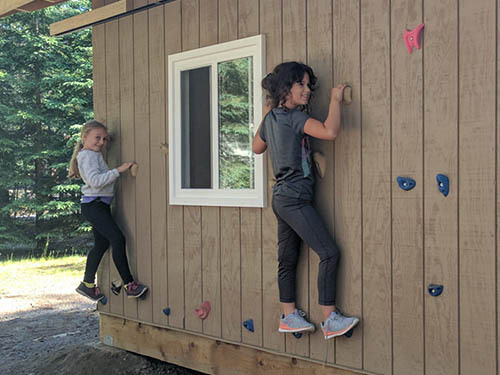 This is a new addition to our craft room building - it is a rockwall just a few feet from the ground for campers to practice their climbing before trying our large wall!